Computational biology requires the reading and comprehension of biological data files. Plain-text formats such as SAM, VCF, GTF, PDB and FASTA, often contain critical information which is obfuscated by the data structure complexity. bioSyntax (https://biosyntax.org/) is a freely available suite of biological syntax highlighting packages for vim, gedit, Sublime, VSCode, and less. bioSyntax improves the legibility of low-level biological data in the bioinformatics workspace. bioSyntax supports computational scientists in parsing and comprehending their data efficiently and thus can accelerate research output. A major component of computational biology research involves the reading and comprehension of data in biological file-formats including FASTA , FASTQ , gene transfer format (GTF) , variant calling format (VCF) , protein database format (PDB) [5, 6], and sequence alignment map (SAM)  amongst others . While being easy to parse computationally, these and other biological files often become illegible as their size and complexity increases, including header sections that contain critical data descriptors often required for downstream processing. Syntax highlighting is designed to improve the interpretability of text files with well-defined structures through the application of colour, font, and formatting to differentiate content; typically a set of keywords, structures, and symbols. Originally developed for the code editor Emily in 1971  and later LEXX in the late 1980s , syntax highlighting is now ubiquitous in the computer sciences. There are contradictory findings whether syntax highlighting offers performance benefits on computer programming comprehension or efficiency but syntax highlighting consistently decreases the reported difficulty of work tasks [11–15]. In terms of human perception, colour (via syntax highlighting) increases the visual saliency of data thereby decreasing search times to find a particular symbol in a visual search task [16–18]. A plethora of tools, both stand-alone and web-based, exist to help scientists visualize and process biological data [19–25]. However, there is no comprehensive set of software to assist in direct inspection and interpretation of raw biological data and their headers. The objective of bioSyntax is to improve the human readability of scientific data-formats through seamlessly integrated syntax highlighting and to assist scientists in performing visual search tasks when working with low-level data. bioSyntax is currently ported for four common text editors, Vim (and GVim), gedit (and other linux editors using the GTKSourceView library), Sublime-Text-3, and Visual Studio Code (VSCode), as well as the command-line pager program, less. Additionally, bioSyntax functions as a repository into which syntax highlighting definition files may be deposited by the community for additional scientific file formats. At its core, bioSyntax is a set of syntax-highlighting definition files specific to each port which are themselves a programmed set of regular expressions. Where available, syntax-files are designed using a combination of; official file specifications for SAM v1.5 (https://samtools.github.io/hts-specs/SAMv1.pdf), VCF v4.2 (https://samtools.github.io/hts-specs/VCFv4.2.pdf) PDB v3.30 (ftp://ftp.wwpdb.org/pub/pdb/doc/format_descriptions/Format_v33_Letter.pdf), BED6 (https://genome.ucsc.edu/FAQ/FAQformat.html), and GTF v2.2 (http://mblab.wustl.edu/GTF22.html); example files from databases (NCBI Nucleotide/Protein , Sequence Read Archive , dbSNP , RefSeq , RCSB  and UCSC Genome Browser ); publically available consortium data (1000 genomes project , ENCODE ); and standard outputs from commonly used software (samtools , GATK , bowtie2 , cufflinks  and ClustalX ). Within each program, highlighting of FASTA, FASTQ, CLUSTAL, BED, GTF, PDB, VCF and SAM files is automatically detected by file extension and can also be manually set within text-editors for files with non-standard file-extensions. In gedit, sublime and vim, amino acid FASTA files can be coloured using CLUSTAL , Taylor , Zappo  or hydrophobicity  colour schemes. Large and compressed data can be manipulated on a unix command pipe with the output directly ported into less using explicit bioSyntax format commands: `sam-less`, `vcf-less`, etc. (Fig. 1). For example `samtools view -h NA12878.bam | sam-less - `, or `gzip -dc gencode.v26.gtf.gz | grep ‘MYC’ - | gtf-less -x 10 `. bioSyntax currently recognizes FASTA, FASTQ, CLUSTAL, BED, GTF, PDB, SAM and VCF formats across all four text editors and less. Upon installation, bioSyntax automatically recognizes file-extensions and seamlessly assigns syntax highlighting to these data files. The main benefit of syntax highlighting is immediately apparent through its increased legibility (Fig. 1, Additional file 1: Figures S1 and S2), especially in the deconstruction of verbose content such as plain-text CIGAR strings (Fig. 1a). In each file-format data is organized using contrasting colours to accentuate keywords or data fields. Nucleotides and amino acids are highlighted with distinct colours allowing for users to read sequences and interpret patterns in the alignment. Data fields containing scores such as PHRED base quality or mapping scores are gradient coloured. The overall system of highlighting is also designed to group biological classes, even across file formats (Additional file 2: Table S1). For instance, dark-green is reserved for genomic coordinates in BED, GTF, SAM and VCF, so even if a user is unfamiliar with the SAM format, previous experience associating dark-green in BED or GTF will inform them of the meaning of those fields when presented in a SAM file (Additional file 1: Figure S2). Ultimately, bioSyntax aims to help computational biologists comprehend data using graphical highlighting rather than simple syntactic highlighting. When the data does not have to be read per character or per word, but can be viewed as graphical patterns, underlying information in the data becomes salient, similar to alternative nucleotide representations [37, 38]. This is best seen in complex files such as SAM in which PCR-duplicate reads form block patterns and read density can be approximated by the diagonal similarity of reads at a locus (Fig. 1b). 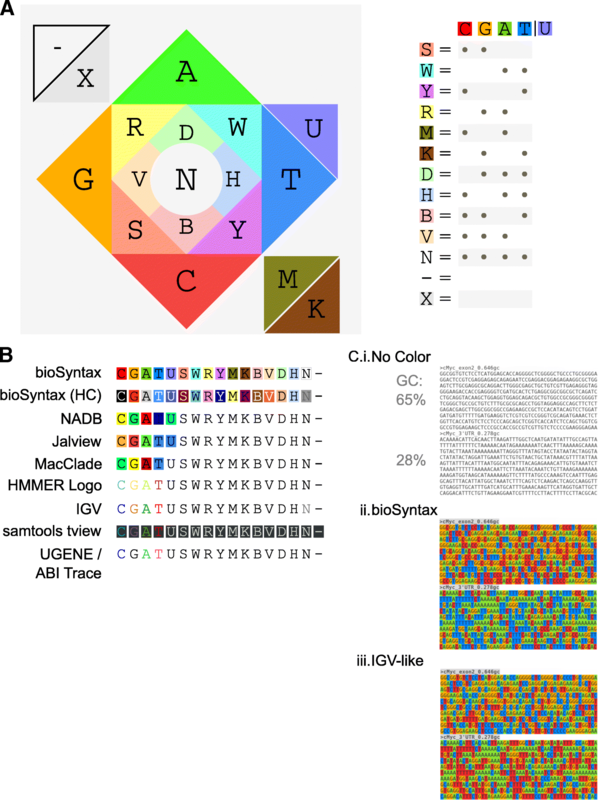 In a user-experience survey of bioinformaticians (Additional file 3: Text 1), 98.6% of users (N = 72) selected bioSyntax highlighted alignments as being easier to identify nucleotide variants compared to a standard monochrome text. Future research on how syntax highlighting can be refined to optimize for user performance is necessary. bioSyntax implements a novel nucleotide colouring scheme for the complete IUPAC ambiguous base set , unlike other colour-sets which are designed for four or five bases (Fig. 2). The four primary base colours are chosen such that additive colour mixing also represents complete base ambiguity. For instance, thymine (blue) and cytosine (red) are pyrimidines (magenta), and the “any base”, N, is white. This colour-set visually distinguishes the strong bases (G,C) and weak bases (A,T) as warm and cool colours respectively, allowing for an intuitive approximation of the sequence GC-content (Fig. 2c). Additionally, a high-contrast colour-scheme is available to aid visually impaired or colour-blind users (Additional file 1: Figure S3). There are scores of biological and scientific file-formats which would benefit from syntax highlighting. To facilitate future development of syntax definition files in science, the bioSyntax repository (https://bioSyntax.org) was set-up. The repository is both a library for scientific syntax highlighting and a community-oriented resource for learning syntax highlighting development. In this manner, researchers experienced in the use-cases of a file-format can quickly develop and share new syntax definition files. bioSyntax assists researchers to intuitively read and navigate biological files in the context of familiar and common text editing tools. 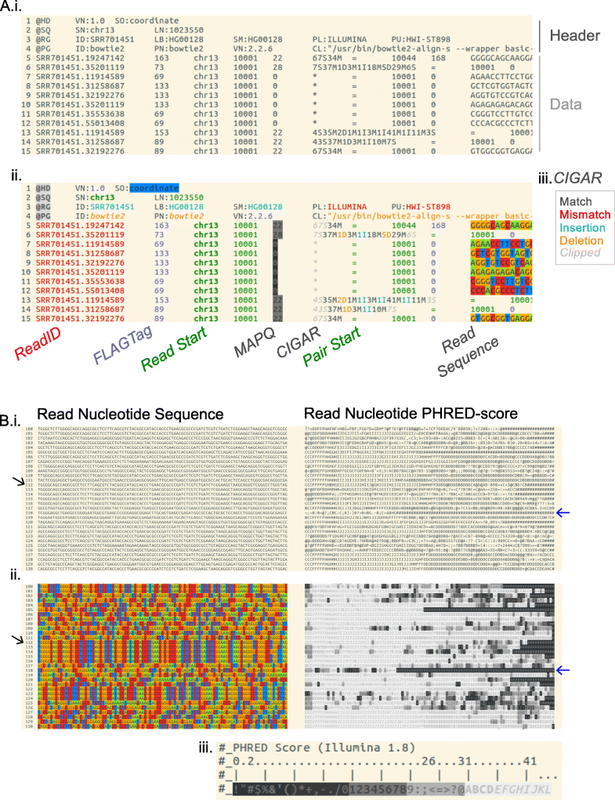 The cross-format unifying colour theme for biological data classes aids users in the rapid and accurate parsing of data with minimal prior knowledge regarding the file-format. Altogether, bioSyntax offers a substantial improvement to the legibility of biological data and helps researchers to grok their data. bioSyntax was initiated at the hackseq17 (https://www.hackseq.com/) genomics hackathon . We would like to thank the organizers for their dedication to making the event happen. We’d like to thank the developers who have contributed to bioSyntax; Ching Pan Eric Chu and Benjamin A Barad; and Joseph O’Brien for his artistic insight in developing a high-contrast palette for nucleotide colouring. AB conceived and led the design/development of bioSyntax. AB, AE, AF, HYK, GEN and JW developed the initial release of bioSyntax and wrote the manuscript. DA packaged bioSyntax for Linux releases. LY ported bioSyntax for VSCode. All authors read and approved the final version of this manuscript. AB is supported by the Roman M. Babicki Fellowship in Medical Research. GN is supported by the UBC International Doctoral Fellowship award. No funding body influenced the development of this software or writing of the manuscript. Source code and all development materials are available at https://github.com/bioSyntax/bioSyntax. Hansen WJ. Creation of hierarchic text with a computer display [internet]. Department of Computer Science, Stanford University. ; 1971 [cited 2017 Dec 11]. Available from: https://books.google.ca/books?id=IZVFAAAAIAAJ.